'Sobji' means vegetables and 'daal' means lentils in Bengali. 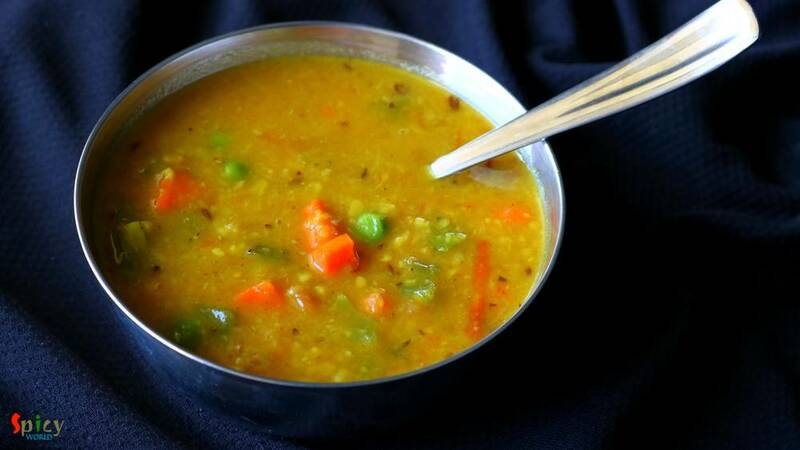 This is a very popular yellow Moong daal recipe which goes best with steamed rice. In Bengali weddings this daal is a must item for lunch. My husband is a fan of this dish. He doesn't even need any sides while having this particular daal and bhaat. Though I need something to go with it, so I have made few Beguni and my simple lunch became gorgeously delicious. Do try this one and let me know how it turned out for you. 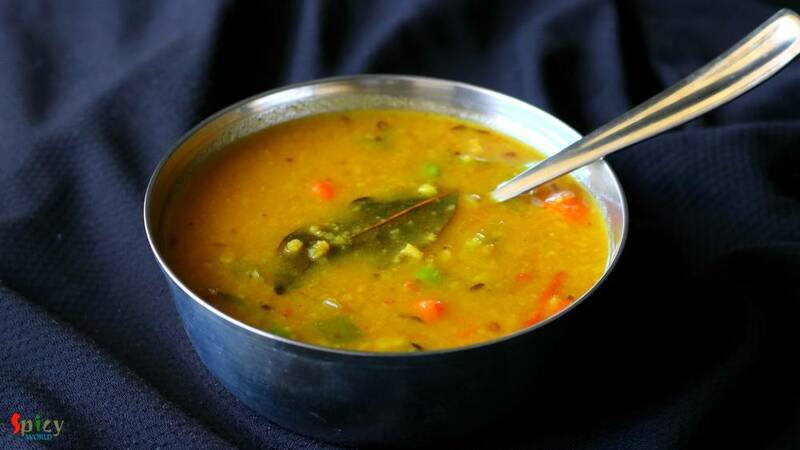 Half cup of yellow moong daal. 1/4th cup of Chopped vegetables like beans, carrots, capsicum, green peas etc. Half Teaspoon of cumin seeds. Pinch of Hing / Asafoetida. 1 Teaspoon of ginger paste. Half Teaspoon of turmeric powder, red chili powder, roasted cumin & coriander powder. 2 Tablespoon of mustard oil. Saute the lentils in a dry pan for 3 minutes on medium flame. Then take it out in a bowl and wash with water. 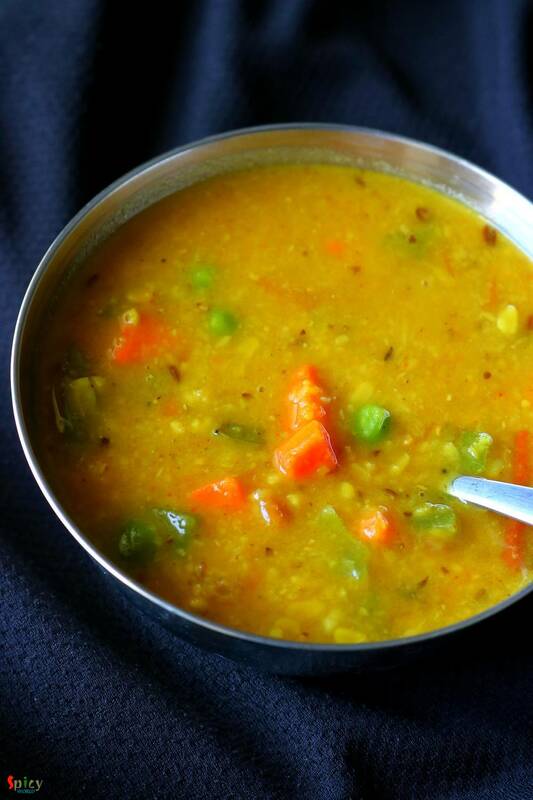 Put the washed daal in a pressure cooker along with a cup of water, some salt and turmeric powder. Cook until the daal becomes soft. Then whisk the cooked daal little bit so that it becomes thick. Now heat a Tablespoon of mustard oil in a pan. Fry the vegetables for 2 minutes, then take them out. You can also add few cashews and raisins if you like. Add another Tablespoon of oil in the same pan and saute cumin seeds, bay leaf and hing for few seconds. Then add chopped tomatoes, ginger paste and some salt. Cook for 4 minutes. Add the spice powder and a Teaspoon of sugar. Mix for a minute. Then add the cooked daal and vegetables. Let it boil for 2 - 3 minutes. Lastly add green chilies and ghee. Turn off the heat and let it rest for 5 minutes. You can also add chopped coriander leaves if you like. Serve hot with some steamed rice. All Images and Recipes are copyrighted to Spicy World. How to prepare Butter Garlic Chicken Stew? Thank you. You are successfully subscribed to our mailing list. Website & CMS Designer, Developer and Architect.